This week's Sunday Night Suds looks at Emek Haela's Irish Red Ale. 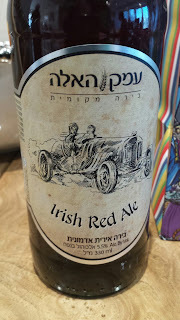 This is another one of the beers which I picked up in the Beer Bazaar stand in Machane Yehuda and so far it is the best of the bunch. In fact, it might be the best Israeli beer I have ever tasted. Emek Haela is one of two breweries which are run by Srigim Breweries (the other is Ronen). A link to the main brewery website can be found here www.srigim-beer.co.il/emekhaela. The beer poured a rich dark copper which bordered on brown. There was decent carbonation, although it did not rise to the level of some American beers. There was not a specific flavor which stood out for this brew, but there was some hops, a little honey and caramel notes and a pleasant malt character in the background which made this a well balanced beer. I would rank this above any American Irish Red that I have ever tried, although it did remind me somewhat of the (late) Pete's Wicked Ale. The Emek Haela is certified kosher, but I left the bottle at the home where we had our Purim sedua and I can't recall who issued the kosher certification. If you have a bottle handy please post the kosher certification in the comments below. To see what the experts on Beer Advocate think about this brew (yes its on BA), please follow this link beeradvocate.com/beer/profile/34175/128573. Also, if you are reading this post more than six months after it was written, please note that it is possible that the product is no longer still certified kosher. To verify that the product is still certified kosher, please check the label on the bottle you are purchasing (since the the kosher beers list link does not include beer brewed in Israel).